Saw this on Jefferson Avenue today. Called this afternoon to see what the program is about. Anyone know who's paying for the billboard? Has anyone spotted these signs in other places? Let me know. Sean Galbraith, Toronto based photographer and urban planner, clued me into his first book, just in time for this holiday season. fixBuffalo readers may remember Sean's work over at the German Roman Catholic Orphan Home down on Dodge Street here in Buffalo - right here. You can buy Sean's first book - Industry - and have it delivered by December's end. Urban decay and demolition by neglect is present in all urban settings. All buildings have a story, a history, a life, and a death. Industrial factories rust. Office buildings slowly crumble. Residential buildings are reclaimed by the elements. It is a rarity that these building evolutions are witnessed by those outside their walls. Sean seeks to go where many have gone in the past, but few go today. To explore, embrace, and bring sight to these spaces and environments from which others avert their gaze. To document that which once was kinetic, but now lies dormant and decaying; Even with man-made objects, death is a part of life and has its own beauty. Had the opportunity recently to invite, listen and record Aaron Bartley talk about what's (not) happening in Buffalo, NY. In this 45 minute presentation and q&a, recently held at the Landmark Society, Aaron discussed the amazing intersection of poverty and the built envrionment in Buffalo and presents PUSH Buffalo's 'Integrated Approach to Neighborhood Revitalization'. Have been a huge fan of PUSH Buffalo for the longest time. Same group that helped draw attention to the plight of Coe Place in November 2006, here. fixBuffalo readers may also remember that Aaron appeared in the Queen City Farm film, too. 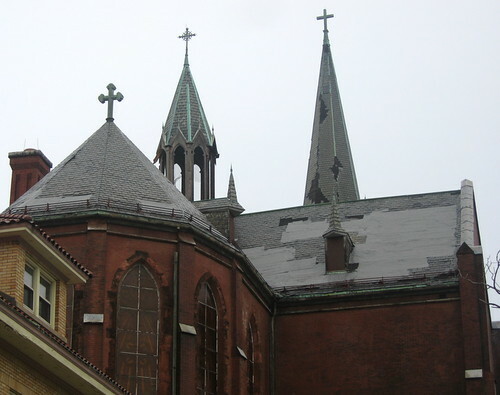 Read this past week in the Buffalo News that William Trezevant has completed nearly 75% of the work on the exterior of recently renamed Transfiguration Church. So went out yesterday to take a closer look at the new Sounds of Joy building. 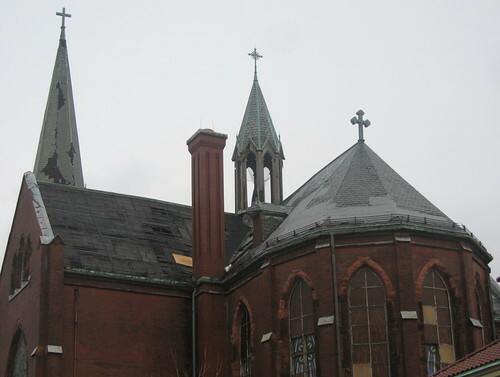 Roofing and window repairs on the former Transfiguration Catholic Church are about 75 percent complete, and efforts are under way to obtain government funding for interior renovations, the principals of the effort said Wednesday. Court proceedings involving the 19th century structure were delayed again Wednesday. I've archived various posts and information about this place - Transfiguration Archive - and will be keeping an even closer eye on the work and latest court date. Last March I stumbled upon the burned out and rotted hulk of a two story warehouse building sitting near the railroad viaduct at 202 Walden Avenue [google map]. Wrote about it here - What if? - and followed up in May with - Wide Open...Why? Found the place to be secured today, more than a year after a devastating fire ripped through this place, the former home of Bandag Tire. Couldn't help noticing the construction trailer and fencing oppostite the former Bandag site recently and quickly noticed the EPA Superfund signage, too. Here's the facility detail report from the EPA site. Rather amazing as this place is located next to two city schools and has been 'wide open' for the better part of a year. Will call on Monday to get the update, 'till then anyone know more about this? Any estimates on the cost of the building's demolition or who's going to pay? Let me know. Was tipped off to the following article that appeared in the Buffalo News last week by a new fixBuffalo reader. Buffalo’s plan to sell property it owns in Perrysburg to a logging company has been voided by a state appellate court. 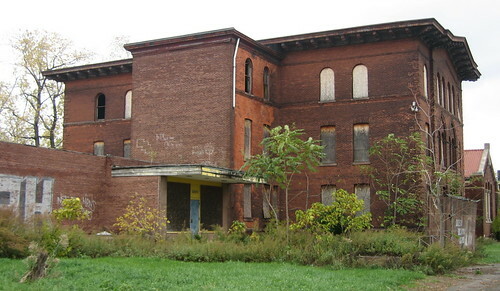 The 649-acre site, once home to Buffalo’s tuberculosis hospital, has been the focus of a three-year dispute. 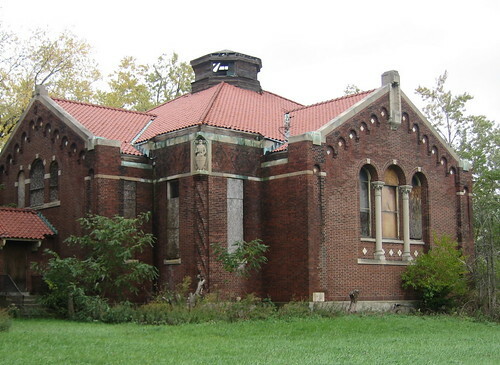 Preservationists have battled plans by Buffalo and the state to allow Trathen Land Co. to acquire the former J.N. Adam Developmental Center. The “friends of JN Adam” have claimed a court victory in stopping of the sale of the JN Adam property in Perrysburg. Who is this victory for? The residents of Perrysburg? The residents of the City of Buffalo? The taxpayers of the State of New York? I first visited Perrysburg in January 2005 and quickly became interested in various issues surrounding what I've previously described as municipal malfeasance. Bottom line still - we can't even take care of our own backyard, I mean since this debacle down in Perrysburg began, Buffalo got a Control Board and vast areas of the City's east side have continued to burn out of control. Why are we so arrogantly inserting ourselves in the life of a community 40 miles to the south? We can't get things right a mile from Elmwood...so why are we trying so hard down in Perrysburg, NY - 40 Miles away? Road tripping soon, for updated pics. Meanwhile here's January 2005 flickr slide show. And here's the Perrysburg Archive. This is not going away anytime soon...stay tuned. I was recently introduced to Verlyn Klinkenborg's The Last Fine Time (1990). It's an amazing read if you're interested in post-war Buffalo social history and the decline of once thriving neighborhoods and cities. Klinkenborg focuses on the lives of the people who made 'George & Eddies' an everyday destination at 722 Sycamore Street, corner of Herman. Today the corner is vacant. From a 1940 Sanborn Map of the neighborhood. Here's the Amazon link - The Last Fine Time. Verlyn Klinkenborg is also a New York Times editorial board member. Here's some recent writing and bio. 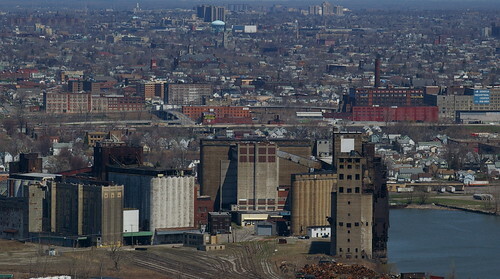 MJ has recently shared another extraordinary set of aerial photos involving some of Buffalo's most amazing industrial sites. fixBuffalo readers may recall MJ's earlier slide show - Air Buffalo. fixBuffalo reader tipped me off to the following article inthe latest issue of one Buffalo's coolest weeklies - The Downtowner. Update...11/20/07...931am If you're arriving here because of a link in the comment stream of a recent Buffalo Rising story - make sure to click through the Sycamore Village Archive and here or here, too. Some chilling foreclosure action in a few blocks adjacent to the Sycamore Village site. Like who wants to spend 180-200K and be saddled with a big mortgage when you could scoop up a new house for 13-20K?? Further signs of a stable neighborhood, huh? 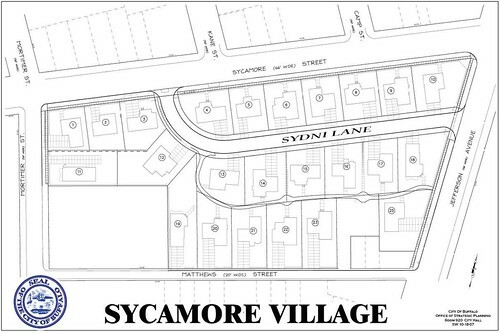 Here's the Sycamore Village archive to bring you up to date! If you haven't checked out the latest from Buffalo ReUse, you really should. They're relocating to Buffalo's near East side at 298 Northampton Street near Jefferson [map]. Amazing new Buffalo ReUse blog. 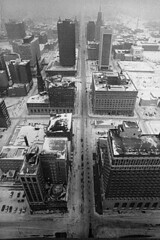 Check out some of their recent pics - Buffalo ReUse on Flickr. A few small house keeping items. You'll quickly notice that I've placed a new link in the template - latest blog comments which helps readers keep track of the dialog around some older posts from months and years ago. I also learned that Google's blogging service, that I've been using since day one, now has enabled an email notification system for comments, too. Very easy to use so you can keep track of what's happening here without having to log in. Very brief explanation - right here - if you're not used to these things. Rss feeds, bloglines and feedburner will still update you as we go along, too. I had an opportunity to check in on one of my favorite sites this morning, down on Dodge Street. Every building here remains wide open. The Community Action Organization of Erie County has owned this place for almost four years. Brian Davis - City of Buffalo Councilman is the President of the CAO's board. No Housing Court for the CAO, wonder why? Check out the German Roman Catholic Orphan Home's archive, for additional information and pictures, inside and out. Here's an overview of the entire complex. Just learned that another Sycamore Village area vinyl-victorian has been taken back in a bank foreclosure. This house at 466 Monroe Street was first sold for $86,500 in 2004. 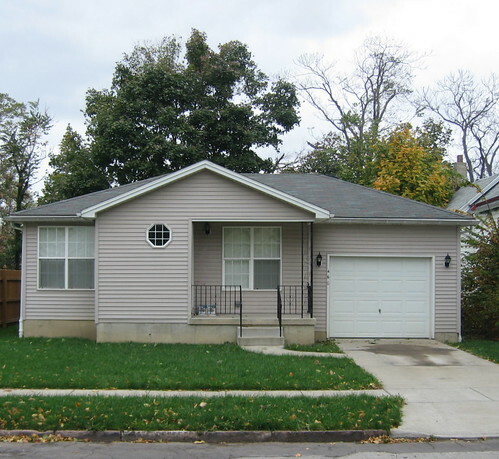 Citimortgage took it back recently - mortage balance and fees placed this foreclosure at $96, 600. The City has assessed the property for $66,500. So, will someone please help me understand why the City is constructing a suburban development just a block and half from 466 Monroe. Bank is Citigroup. Wonder why they are taking hits? Mortgage melt-down begins right here on Monroe Street. Place will probably re-sell somewhere in the mid 20's. Remember 241 Monroe, from last week? Posted about RUN Buffalo recently - Running Buffalo - this past August. Late last week I received a press release from the folks at New Era Cap, one of RUN Buffalo's corporate sponsors asking for volunteers to help out with the landscaping over here on Sycamore Street. fixBuffalo readers may remember this post - Buffalo's Death Row - from summer 2006, where Yvonne Peterson's body was found in the partially boarded City owned house at 830 Sycamore Street, one of the three houses recently demolished here. Well those three houses, on one of the most devasted sections of Sycamore Street, are in the landfill. 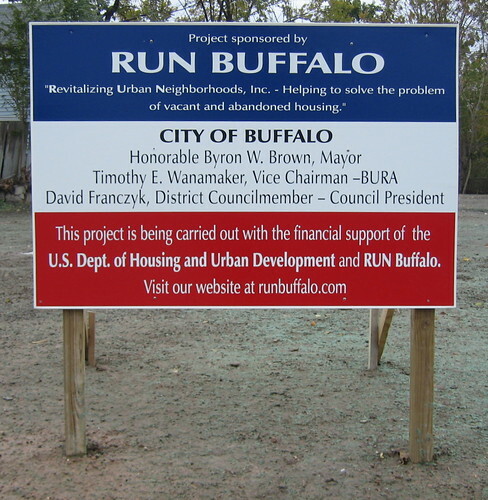 RUN Buffalo will be maintaining the vacant lots, for like forever. Very interesting arrangement and am wondering who actually owns the property. Anyone know who actually paid for these three demolitions? Progress on Bethel Headstart's new child care center here at the corner of Jefferson and Woodlawn. fixBuffalo readers will remember that Rev. Stenhouse is guy behind the scene with this project. I recently profiled some of his other work here and understand that the Buffalo News will be following up on his Housing Court case, very soon. Will be keeping tabs on both developments. This same corner looked like this, last week. Register here for the conference and learn more about Toronto's Artscape and how other cities mix up art and older spaces. Sean from TO is a never ending source for information here about Florida's Mega. 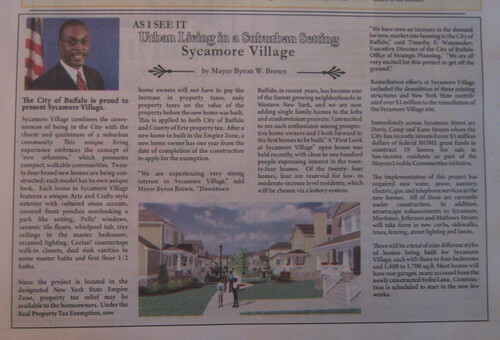 fixBuffalo fan tipped me off to this link on the City of Buffalo site - The Sycamore Village Experience! Check out the various descriptions and floor plans - here. I've been keeping track of the Sycamore Village experience - Sick Yet, Part II. So, who's Sydni? Julie Barrett-O'Neill, Buffalo-Niagara Riverkeeper, just called my attention to an amazing new group here in Buffalo, NY that's organizing around some very progressive policy initiatives - Partnership for the Public Good. 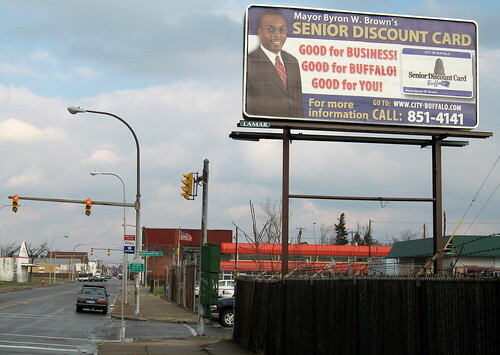 The Coalition for Economic Justice (CEJ) has launched a Partnership for the Public Good (PPG) to promote a community-oriented vision of a revitalized Buffalo. CEJ is joined in this effort by other groups such as PUSH Buffalo, Buffalo ReUse, the Homeless Alliance of Western New York, and Buffalo First, as well as by faculty from Cornell ILR and the University at Buffalo Law School. PPG is a "think-and-do" tank that will perform research and advocacy and will support the efforts of the broad array of organizations working to revitalize Buffalo. Various policy briefs are archived, here. If you haven't read Edward Glaeser's Can Buffalo Ever Come Back?, you should. Little bit of traction here and was later picked up by Buffalo Rising with a fire-storm of comments - 106 at last count - Teary Eyed Buffalo Bashing. The conversation continues with Tyler and Alex at Marginal Revolution with a great comment stream. Noticed another thread at Sky Scraper Page, too. Just finished reading Deputy Erie County Executive Bruce Fisher's response to Edward Glaeser in the most recent issue of Artvoice - What Will it Take? way worth reading. Sean from Toronto tipped me off to Richard Florida's newest blog Creative Class over at The Globe and Mail. Tip comes via post at Spacing Toronto. You'll want to add both of these to your daily read. If you haven't been following Florida's take on integrated regional plannig issues impacting Buffalo, make sure to check out the growing critique here - Putting the Buff in Tor-Buff-Chester. Love this pic! Richard, Sean or anyone - have any more?